Power scrubber brushes do deep-cleaning jobs quickly and effectively. Fit one onto your power drill and let it do the work. Opt for firm bristles to tackle tough surfaces like brick, grout, and linoleum, or you can pick one with a rounded design to better get into corners. The soft bristle scrubber works well on carpet and upholstery. Weight: Flat: 0.35 lb. ; Corner: 0.25 lb. Drill Brushes do scrubbing jobs faster—and probably better—than you. (No offense.) How? 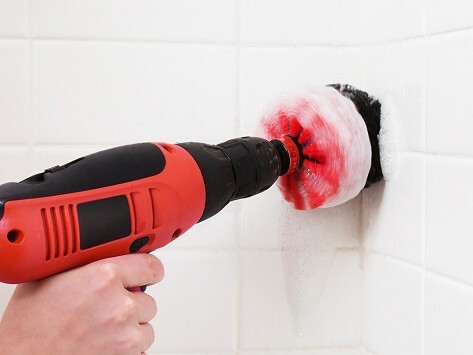 These scrubbing brushes and pad attachments are powered by a drill, not your arm. There are brushes suited for tough work like cleaning brick, grout, and linoleum, or you can opt for a rounded design to really get into corners. Go for a brush with softer bristles to handle jobs on carpet and upholstery, or try a scrubbing pad to tackle grime in places like the shower or on glass stovetops. The scrubbing brushes and pads are efficient and effective alternatives to, you know, you, and using one sidesteps any potential repetitive motion strain triggered by tough cleaning jobs. All that, and it is oh-so-satisfying to see one in action.